Introducing the latest addition to the Minik10 family, KSQ's MiniK10mc Mifare Model for lockers. The Mifare model holds all the same great features of the standard minik10, now with an integrated Mifare reader. It is the worlds smallest and most eco-friendly digital cam lock, with a battery life of up to 8 years! The Minik10 is suitable for new lock installations, using only two holes or retrofitting conventional key operated cam locks. 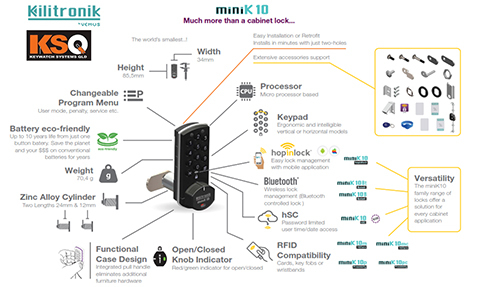 The MiniK10 features one-time user operation or permanent user code, Master Program and Supervisor Override codes, NFC phone programming and opening with the free Hopinlock locker lock management app. These digital electronic locker locks suit all timber, plastic, and steel doors. They are perfect for cabinet locks at gyms, fitness, sports clubs, employee lockers, commercial and government office fit-outs, letter-boxes, and many more applications across Australia. They are available in black or white and horizontal models to suit both left and right handed doors. Surface or Semi-flush mounting options. The MiniK10's are the smallest digital electronic locker locks in the world and are the perfect solution for keyless and wireless electronic access to lockers, cabinets, and drawers. Visit www.keywatchsystemsqld.com.au to find out more about Minik10mc Mifare Lock today. 76/2898 Gold Coast Hwy, Surfers Paradise, Qld, 4217. I would like to enquire about Keywatch Systems Qld.